Some of our key client forms to help make turn the complexities into simplicities. (Just click on the file names to download). This document is used by our insurance clients to prepare for a life insurance application over the phone or by Skype remotely. This checklist is designed to save you time and outline the information you'll be asked to provide during your remote interview with your Sapience Financial Adviser. Getting ready to apply for a home loan? Here's our document checklist and family budget template outlining the necessary supporting paperwork you'll need to apply for a home loan (and the general reasons why). The more you get to understand the process and how it will affect you financially, the more confidence you'll have in your financial decisions. This is an interactive PDF so you can fill it in online and save a copy to print out. SMSF (Self Managed Superannuation Fund) trustees have strict requirements to monitor and assess the liquidity of the SMSF for the benefit of its members. We provide annual liquidity assessments for SMSF Trustees and use this worksheet to help them prepare and pre-assess their own position. Need to learn more? Watch our video interview SMSF Trustee Liquidity Requirements. 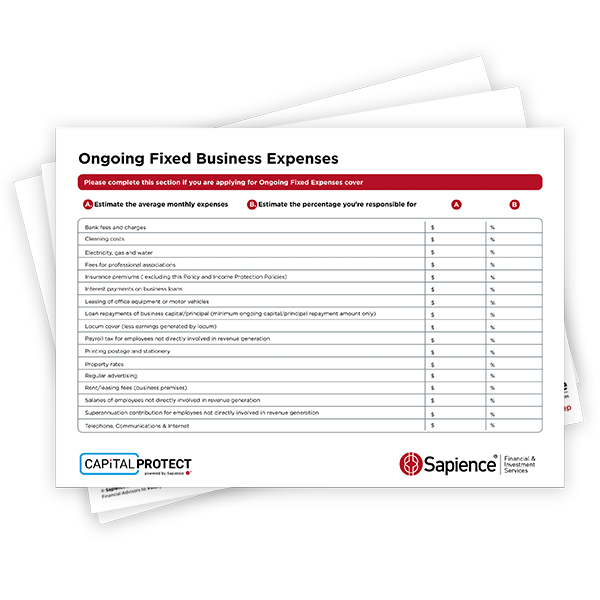 This document is used by our insurance clients to help check their ongoing fixed business expenses for Business Expenses insurance purposes. This checklist is designed to save you time and outline the information you'll be asked to provide during your interview with your Sapience Financial Adviser.